The GoToMyAccounts eCheck (aka Check Draft) payment method is different than all the other payment methods supported. Don&apos;t confuse this payment with the QuickBooks Payments "e-check" method which is actually an ACH payment method. A more accurate name for this payment method is in fact, "check draft". That&apos;s because the payment involves the actual creation of a "draft" and it is printed on a physical paper form. It many ways, the mechanics of this payment method is similar to ACH. The customer enters their bank account information (routing number, account number) but rather than being submitted to the Automated Clearing House (ACH), a physical check is generated which is then deposited like any other check. What are the benefits of this method over ACH? There are some pros and cons to ACH and check draft. One thing to keep in mind is that ACH does NOT remove money from the payor&apos;s account instantly, nor does it know or confirm there IS money in their account. In fact, most payment gateways that support ACH have what is called a "micro deposit" system which does two things. 1) It confirms the customer&apos;s intent to allow the ACH transaction(s), and 2) it confirms the account is valid and exists. Chargebacks with ACH though can be a VERY sticky situation. If you, as the merchant, do not follow the authorization requirements to the letter, the transaction can be reversed and you have little or no recourse. The second thing to consider with ACH is funding time. Some gateways will fund the transaction in 1-2 days, while in some cases it can be as much as a week. But remember this... a check you deposit to your bank goes through essentially the same clearing house (check 21). The difference though is in funding time and the ability of the customer to stop payment and/or challenge the transaction. The rules on this vary, so check with your bank for the exact details. Consult with an expert, an attorney, and an accountant. But there are basically three factors that are important to focus on. Does your product or service involve a physical tangible item that has value? If the answer is yes, you must assess the risk of disputes and chargebacks. You won&apos;t just be out the chargeback and/or NSF fee, but you also lose the product. Whereas, if you are selling a service or a subscription-based product, there is far less risk. If the payment fails or the customer challenges the transaction, simply turn off the service. Worst case is you lost a month or two of revenue to someone who had no intention of paying you anyway. Do you know your customer well? This is an important factor. If your customer is well-known to you and has a good payment history, then both ACH and Check Draft are great payment methods to choose. The cost is low and there is very low risk of them disputing charges that have been part of a long stream of payments. If your customer is new, it may be better to set them up with a payment method like Credit Card or PayPal. Do you have high volume? This is where Check Draft can become unfeasible. 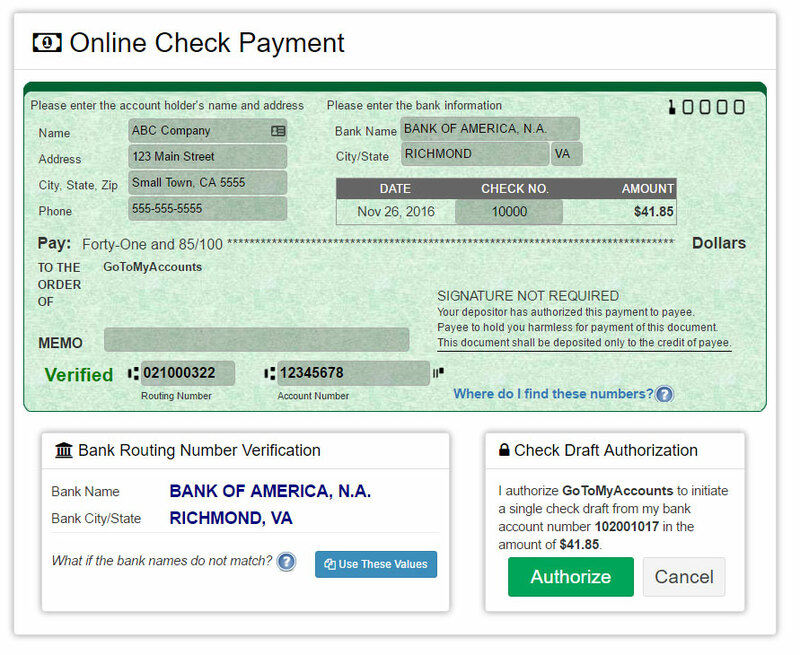 With Check Draft, someone is going to need to print checks and deposit them. Check scanners can do a pretty good job of this, so a moderate amount of volume can still be workable. When one looks at the cost of credit card discount points, it may very well still be worthwhile to have office staff print and deposit checks. If the transaction amounts are high, even more so. However, if you have thousands of small payments coming in each month, or your payment amounts are relatively small, then check draft is really not suitable. GoToMyAccounts does allow you to set minimum and maximum amounts for each payment method, so you can still offer Check Draft (and other methods) and set when they are allowed. What is the eCheck (check draft) workflow? Prior to enabling the method, you should visit your local office supply store and buy some blank check stock. Unless you plan to do high volume, I would suggest a simple one up (single check on top) layout. When check payments come in, you can set the option to receive a notification. There will also be a notification in the top menu area of the portal showing the number of new checks to print. Print the checks. You can access this from the "Billing" menu, or just click on the notification mentioned above. The printed check will be in PDF format. Simply load your check stock and print each check. If the alignment is off, there is a button to make adjustments. You can always reprint the check if needed. Use remote deposit (scanning) or deposit in person. Many banks now support remote deposit by scanning the paper check. This is VERY convenient and saves a lot of time when using this payment method. Funding will typically be the same as any other check you deposit. For established accounts, this is often 1-2 business days. How does the customer sign the check? Signing a check draft payment is not required. There is a standard (approved) verbiage that appears in the signature area. This states that you have obtained authorization from the customer. It is also advisable to get a separate signed authorization from your customers. Again, consult with an accountant and/or attorney for advice on how to secure proper authorization for payments. The customer can set the check number they desire so it corresponds to the series they are using for their account. On subsequent payments, this will increment. However, the customer can always override and use some other check number. Is there a cost to use eCheck (Check Draft)? No. GoToMyAccounts does not charge any transaction fees on any of the payment methods we currently support.